Following Friday’s game, Clearfield has been held to under 300 yards of total offense just twice over the past 31 games: Week 7 of the 2012 season at Tyrone (247 yards) and in the state playoff loss to Berwick last year (289). At the halfway point of the 2014 season (5 games), the Bison have nearly matched last year’s passing stats through 14 games. The 2014 team has gone 41 for 96 for 732 yards, 8 touchdowns and 6 interceptions. Last year’s season totals were 43 completions in 105 attempts, 908 yards, 8 touchdowns and 7 interceptions. Through the team’s first five games, Clearfield is averaging 66 plays per game. The current school record (since 1974) is 63.7 plays per game during the 2005 season. Over the past 3 games, the Bison are averaging 72 plays per game. After averaging more than 9 penalties per game in Weeks 1-3, Clearfield has a total of 7 penalties over the past two games. 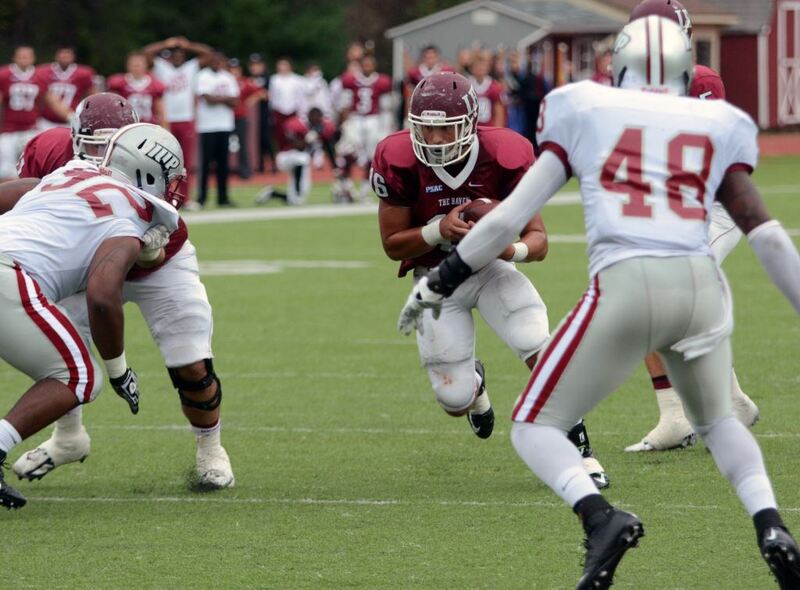 In Week 1 versus Keyser, the Bison allowed 50 rushes for 311 yards and 4 touchdowns. In the four games since then, Clearfield has allowed an average of 24.5 carries for 26.3 yards and 3 total rushing touchdowns. Opponents are averaging 2.8 yards per carry against the Bison this season. In the first five games of the 2014 season, Clearfield is out-gaining its opponents by an average of 349 yards to 202. 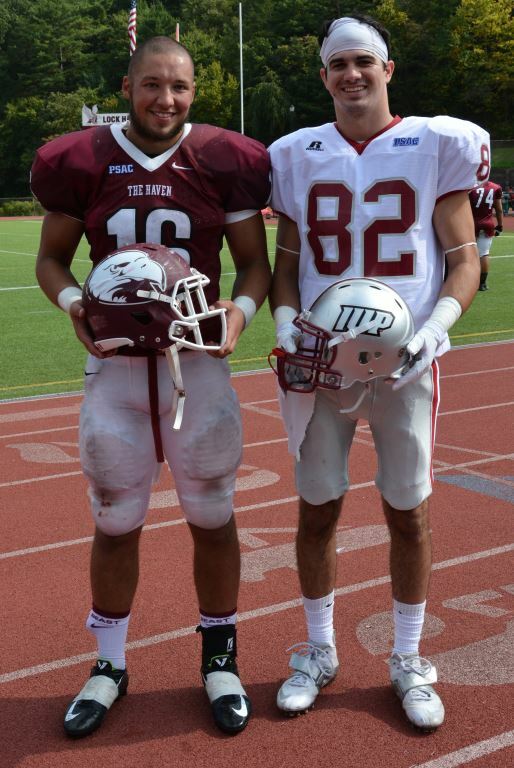 This past Saturday, a pair of standout Bison alumni faced off in a PSAC clash between IUP and Lock Haven. 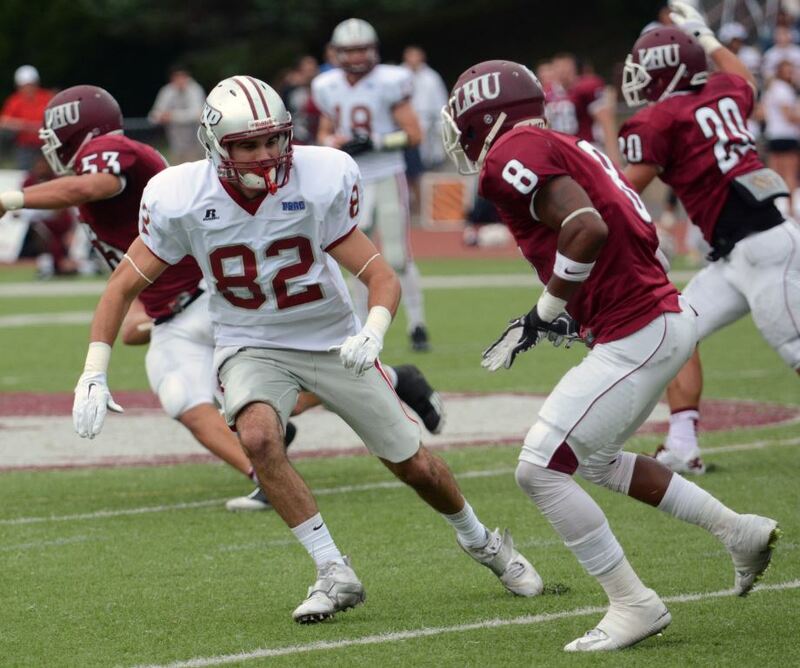 Trey Campman, a 5th-year senior for the Crimson Hawks, and Beau Swales, a junior for the Eagles, met as IUP won, 21-16. The two players left their marks on the Clearfield football program in the recent past and have continued on to collegiate football. 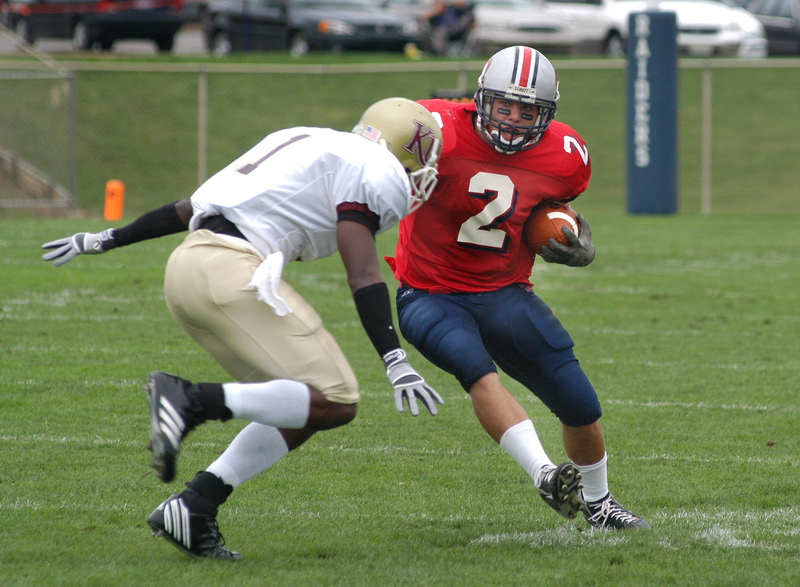 Campman played for the Bison from 2007-2009 and graduated as the school’s leader in career receptions with 130. He is second in career receiving yards (1,961) and tied for 8th in receiving touchdowns (16). 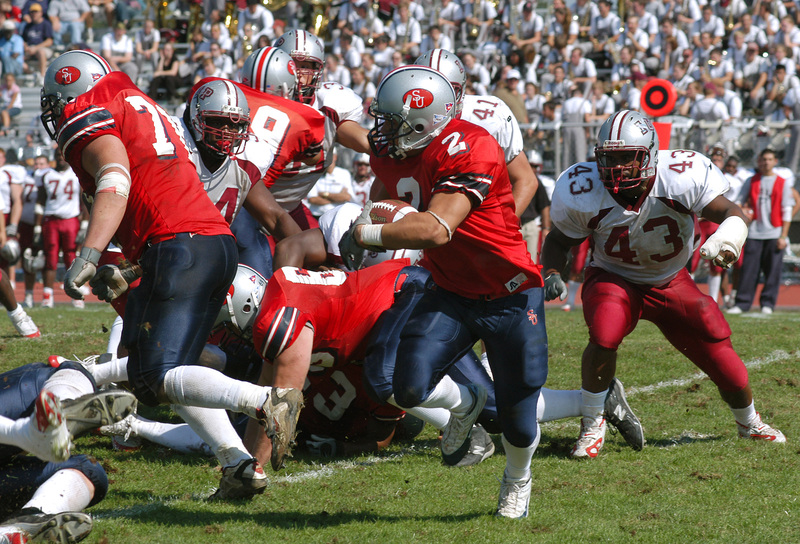 Campman’s 992 receiving yards in 2009 put him just shy of becoming the fifth player in school history to have 1,000 yards receiving in a single season. During his junior season, Campman caught 2 passes for 81 yards (including a 51-yard touchdown catch) in a playoff loss to Erie Strong Vincent, then ranked the No. 2 AAA team in the state. On defense, Trey is tied with his brother Jarrin and Adam Hertlein for third in career interceptions (10). He finished his time as a Bison with over 2,200 yards from scrimmage and 23 total touchdowns. Perhaps Campman’s biggest performance came in a 35-19 win over Philipsburg-Osceola in 2009. He caught a 93-yard touchdown pass and finished with 8 catches for 178 yards. He added a 16-yard interception return for a touchdown. That same season, he caught 9 passes for 149 yards against Bald Eagle Area, 8 catches for 134 yards against Punxsutawney, and 5 catches for 132 yards against Indian Valley. Swales was a Bison from 2009-2011. During the 2011 season, he ran for 1,962 yards on a school-record 281 carries. His rushing yardage from that season stands as the second most in school history, trailing only Dave Richards’ 2,515 in 2002. Swales ranks fifth all-time in school history for rushing yards, finishing his career with 2,713 to go along with 44 total touchdowns (fourth most in CHS history). Defensively, Swales’ 203 tackles rank fifth in Bison history; he added 4 interceptions and 5 fumble recoveries. During his junior and senior seasons, Clearfield went a combined 24-3. 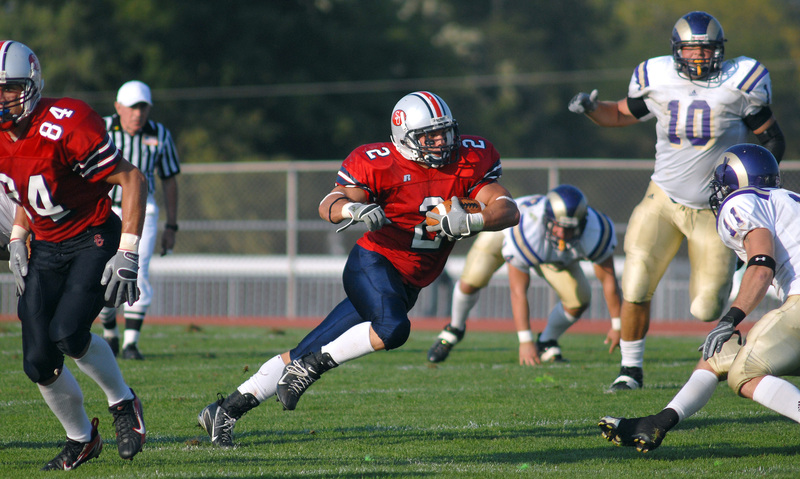 Swales rushed for at least 200 yards in one game 3 times in his career with all three taking place in the 2011 season. He ran for 257 yards against Central Mountain, 215 against Hamburg, and 211 against St. Marys. In what was probably his best all-around game, Swales scored 4 touchdowns against Philipsburg-Osceola in a 56-25 win in 2010. He ran for 138 yards and 2 touchdowns on only 7 rushing attempts, an average of 19.7 yards-per-carry. He added a pair of interceptions returned for touchdowns; the first covered 32 yards and the second went for 27 yards. 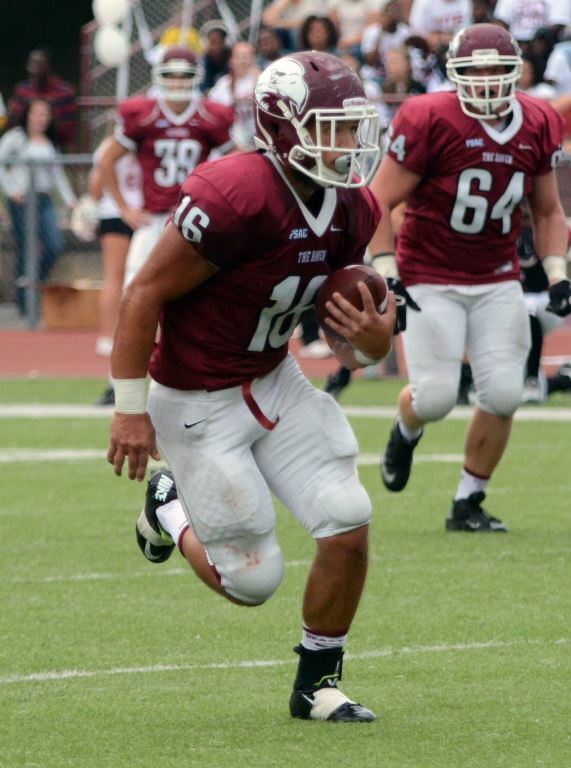 Campman and IUP will face another CHS alum this Saturday when Mercyhurst visits Indiana. Mercyhurst’s offensive coordinator is former Bison quarterback Andrew Janocko (2004-2006). All-Time Series: Brockway leads, 1-0. 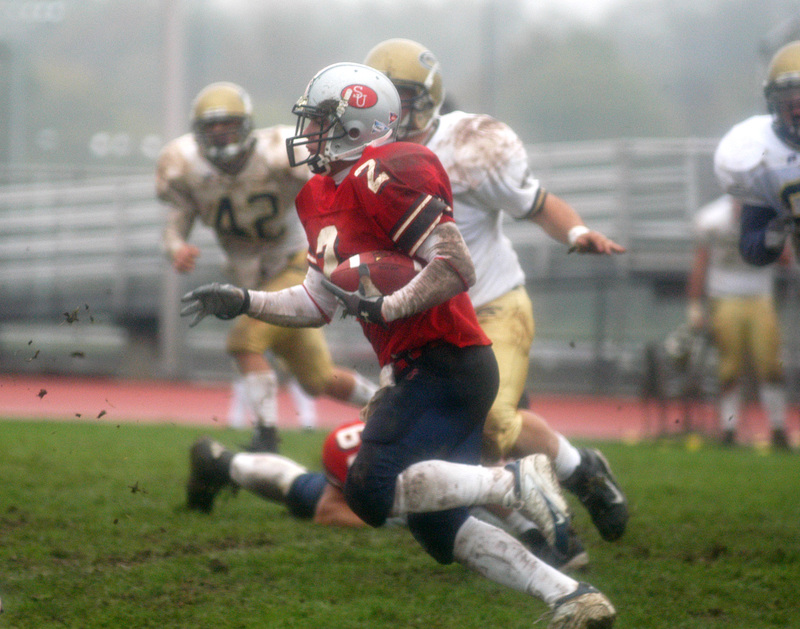 The Rovers beat the Bison 24-21 in Brockway during the 2006 season. Brockway and Clearfield are only separated by 38 miles, but the two schools have played only once. In 2006, the Bison found the end zone on their first three possessions, but blew a 21-0 lead and lost 24-21 in the regular-season finale. The Bison lost two fumbles, threw four interceptions and were held to 101 yards on 36 rushing attempts. The Rovers haven’t been challenged much in their first four games, outscoring opponents 154-20. Brockway began the season with a pair of shutouts, beating Smethport, 38-0, and Coudersport, 48-0. They then beat Cameron County, 35-7, before last week’s win over Otto-Eldred. In the latest D9Sports.com First Commonwealth Bank Football Rankings, Brockway sits at No. 4, behind Karns City, Clarion, and DuBois. Clearfield is currently at No. 9. Ridgway, Redbank Valley, Curwensville, and Kane make up the schools that are rated in between the Rovers and the Bison. Friday’s game marks the second of just four home games for Clearfield this season. Despite losing their home opener to Central, the Bison have a home record of 29-3 (.906) since the start of the 2008 season. Clearfield’s home slate is rounded out by visits from Bellefonte next Friday and Philipsburg-Osceola on Senior Night, which will be held on October 24th. Seth Caldwell’s 227 rushing yards marked the 38th time a Bison has rushed for at least 200 yards in one game. His total ranks 17th in school history and is the most for a Clearfield player since Christian Lezzer ran for 233 yards against Punxsutawney in the 2012 playoffs. Caldwell’s big night also pushed him past 1,000 rushing yards for his career. He now sits in 24th place in school history with 1,199 yards. In just the 4th game of his sophomore season, Caldwell reached the 1,000 yard milestone earlier in his high school career than any other Bison. Clearfield ran 81 plays Friday night, the most a Bison team has run since running 86 plays against DuBois in the 2008 season opener. Meanwhile, the 21 total plays run by Huntingdon are the fewest by a Clearfield opponent in history. Philipsburg-Osceola ran just 23 plays in a 26-6 loss to Clearfield in 1992. Huntingdon’s 53 yards of total offense is the lowest amount allowed by Clearfield since Central gained 52 against the Bison in 2010. Clearfield’s 67 rushing attempts against the Bearcats are the second-most in school history, trailing only the school’s 1947 game against Punxsutawney, when the Bison had 68. The 391 rushing yards by the Bison rank 14th on the school’s single-game list. Clearfield’s 466 yards of total offense are tied for the 19th most in school history with the 1954 win over Osceola Mills and the 1997 win over Curwensville. In Clearfield’s last two meetings with Huntingdon (2013 and 2014), the Bison have rushed 125 times for 810 yards and 12 touchdowns. The first Bison to officially rush for at least 1,000 yards in a season, Stu Wiggins was a standout player from 1950-1952. He was named AP Third Team All-State as a junior in 1951 and made the AP’s first team in 1952. Wiggins totaled 1,165 yards rushing and 11 touchdowns as a junior and 1,204 yards and 17 touchdowns as a senior, but running wasn’t his only strength on the field. Wiggins was a terrific defensive player and passed for 1,036 career yards and 13 touchdowns, making him the first player in Clearfield history to officially throw for at least 1,000 yards in a career. Wiggins also kicked during his high school career. Clearfield went 5-5 in 1951 but rebounded the following year, going 9-1. The Bisons narrowly missed an undefeated season by falling to DuBois, 13-6, in front of more than 6,000 fans at E.J. Mansell Stadium in Week 3. Wiggins’ 129 points that season led the area and helped the Bison average a then-school record 28.3 points-per-game. Wiggins had a number of outstanding games in his career, many of which came during the 1952 season. He ran for 3 touchdowns against Osceola Mills, ran for 3 and threw for another versus Philipsburg, had an 87-yard TD run against Bellefonte, ran for 3 touchdowns against Cooper Township, and scored 2 touchdowns, threw for one, and kicked 6 extra points versus Curwensville. In 1951, he ran for 295 yards against State College and 209 against Philipsburg. Wiggins went on to play football at Penn State. Clearfield has played the Bearcats 24 times since the two teams first met in 1914, the second full season of football the Bison had ever played. The schools played each other regularly from 1914-1923 and then didn’t meet again until 1979. 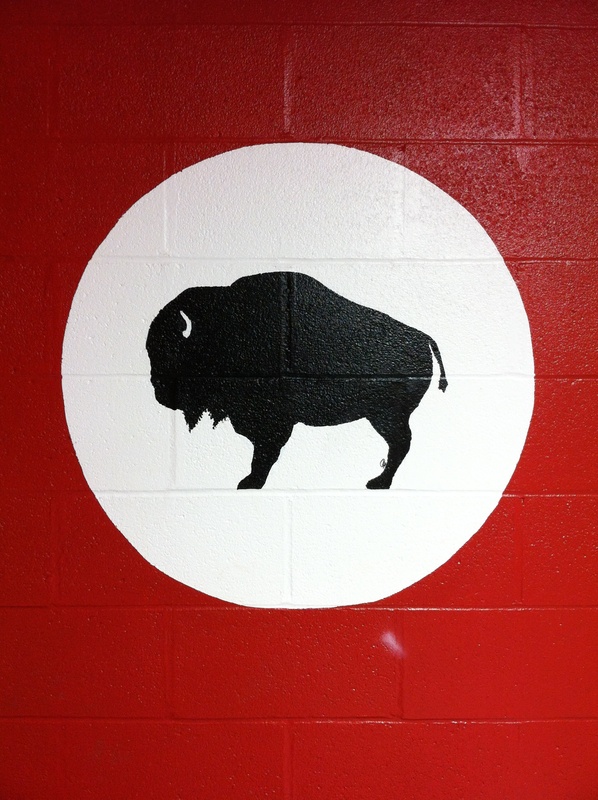 Friday night will mark the 11th consecutive year that the Bison have faced Huntingdon. The 1998 PIAA playoff game won by the Bearcats 68-34 marks the most points a Clearfield team has allowed in the last 90 years, when Lock Haven beat the Bison 73-26 in 1924. The 1998 matchup in Punxsutawney ended Clearfield’s 11-1 season, although the two teams were tied at 28 at halftime. Clearfield ran for 325 yards (including 222 from Jimmy Lewis) but fumbled 4 times, while Huntingdon averaged 11 yards per play on the night and didn’t turn the ball over. The win sent Huntingdon into the PIAA Western Semifinals where they would beat Perry, 44-18. The following week, the Bearcats fell in the Western Final to Moon, 21-0. Three Clearfield players have rushed for at least 200 yards against Huntingdon: Lewis, Josh Harbold (220) in 2004, and Christian Lezzer (202) last season. In 2012, Trey Jordan caught 4 passes for 136 yards (34 yards per catch) and 4 touchdowns against Huntingdon in a 41-24 Clearfield win. Last year’s 508 total yards against the Bearcats marked the 8th time a Clearfield team has gained at least 500 yards on an opponent. The 8 rushing touchdowns by the Bison set a school record. – Clearfield’s loss to the Dragons marked CHS’s first conference loss in 27 games. The last time the Bison fell to a conference opponent was October 9, 2009, a 34-21 loss to Bald Eagle area. That game was also the last time a Clearfield team fell at home, breaking a streak of 21 consecutive wins (including playoff games) at the Bison Sports Complex. – Central handed coach Tim Janocko his 100th career loss in his 333rd career game. Janocko’s career record now stands at 230-100-3 (.695). – After falling to Keyser (WV) and Central and beating Penns Valley, the Bison have their first 1-2 start since the 2007 season. That year, Clearfield beat Bald Eagle Area before falling to Brookville and Hollidaysburg. They would finish the year 7-4. – Central’s 290 yards passing is the most given up by a Clearfield team since allowing 353 yards in the final game of the 2012 season, a 36-22 loss to University Prep in the subregional playoffs. Central passed for 309 yards against the Bison that same year, but Clearfield won the game, 34-33. – The -1 yards rushing by Central marks the fewest yards gained on the ground by any team to ever beat Clearfield. 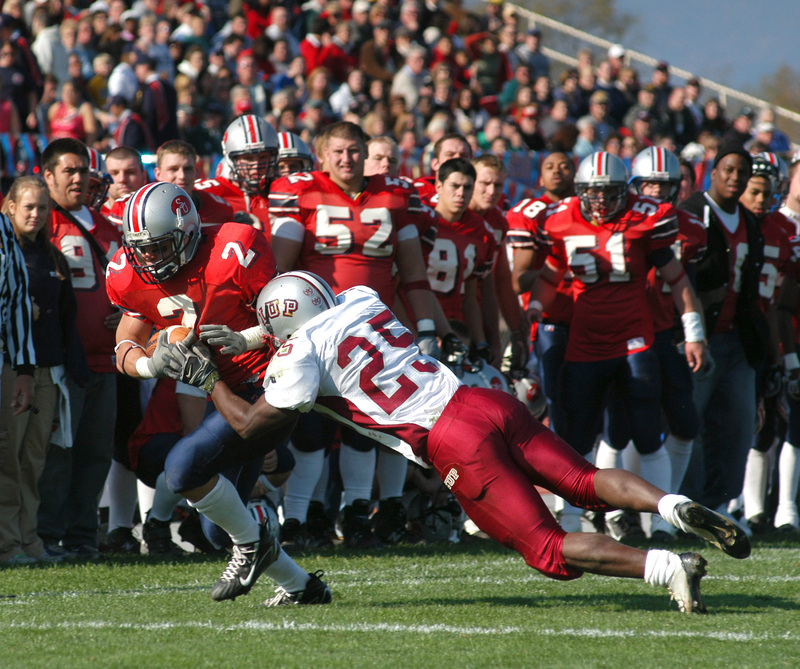 In 2003, Brookville beat the Bison 14-12 despite rushing 35 times for 13 yards. In 1981, Bellefonte and Clearfield tied a game in which the Red Raiders rushed 24 times for 5 yards. – Friday was the 3rd consecutive game in which Clearfield passed for at least 100 yards, the first such streak since the Bison passed for 100+ yards four weeks in a row during the 2012 season. Clearfield surpassed 100 yards passing only once in 14 games during the 2013 season. – According to various reports, former Bison Christian Lezzer will have his redshirt removed and will play for Boston College tonight against USC. The game kicks off at 8 p.m. and will be aired on ESPN. Dave Richards played four seasons for Clearfield (1999-2002) and graduated with a number of school records, many of which he still holds. He is the school’s all-time leader in rushing yards (4,639), rushing touchdowns (69), total touchdowns (80), and yards from scrimmage (4,998). Richards also holds several single-game records, including single-game rushing yards. In one of the most impressive performances in school history, Richards ran for 363 yards and 7 touchdowns on just 16 carries against Bald Eagle Area in 2002. Averaging 22.7 yards per carry despite the thick mud that covered the Bison Sports Complex, Richards broke the 300-yard threshold by halftime. It was only Clearfield’s 7th game of the season, but Richards set the then-school record for single-season rushing yards, eclipsing Kenny Wisor’s mark of 1,491 yards in 1998. 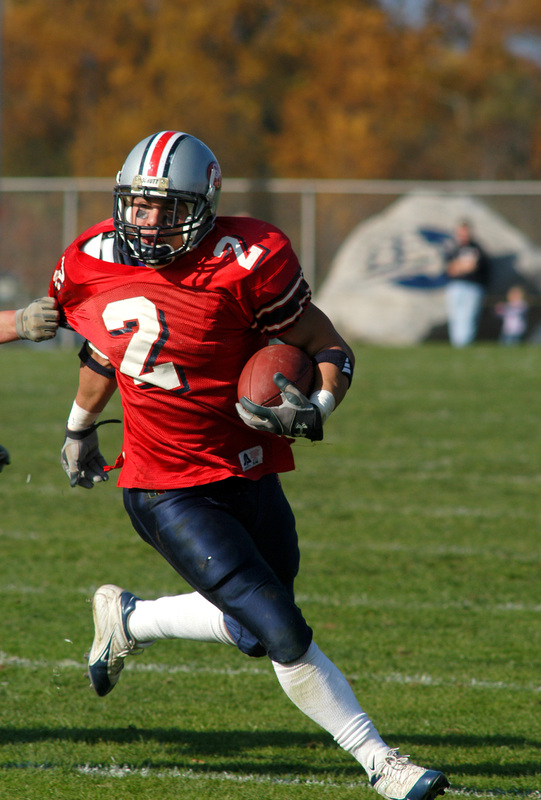 Following the 2002 season, Richards was named First Team All-State and the Class AAA Player of the Year by the Pennsylvania Football News. He was also named to the AP’s Second Team and set the District 9 records for single-season rushing yards (2,515), rushing touchdowns (41), total touchdowns (45), and points scored (276). The following summer, Richards represented Clearfield at the Big 33 game in Hershey. Central has an identical record as Clearfield (1-1) thanks to a Week 1 win over Tussey Mountain (34-12). Clearfield has beaten Central in each of the past six seasons, but the Dragons have had some very good teams during that span. Central went 11-3 last year, 8-3 in 2012, 10-2 in 2009, and 11-3 in 2008. The 1982 win versus Central marked the first time the Bison had won by 40 or more points since beating Tyrone 45-0 in 1958, a span of 24 years. For comparison, Clearfield has seven 40+ point wins since the start of the 2011 season. In that 1982 game, Bison quarterback Bob Sunderland – then a junior – averaged 50 yards per completion, connecting on 4 passes for 200 yards and 3 touchdowns. Bison receiver Randy Learish caught two passes for 128 yards. Friday’s game will mark the 2014 home opener for the Bison. Since 2000, Clearfield is 60-10 at home and hasn’t lost a game at the Bison Sports Complex since a Week 6 loss to Bald Eagle Area (34-21) in 2009. Since 1999, the Bison are 11-4 in home openers. This year’s Clearfield-Central game will also kick off the 38th season that the Bison have called the Bison Sports Complex home. The first game at the field was held in Week 1 of 1977, a 27-7 win over Tyrone. The Bison continued their winning streak against the Rams and have now won all 8 meetings between the two schools. Clearfield has now thrown for at least 100 yards in each of its first two games for the first time since 2010 and the team’s two-game total of 426 yards passing is the program’s most through the first two games since 2009 (486 yards). The Bison also avoided the school’s first 0-2 start since the 2003 season and will try to get to 2-1 in the 2014 home opener next Friday against Central. Friday was also the 23rd time since the start of the 2010 season (55 games) that the Bison held their opponent to under 200 yards of total offense. 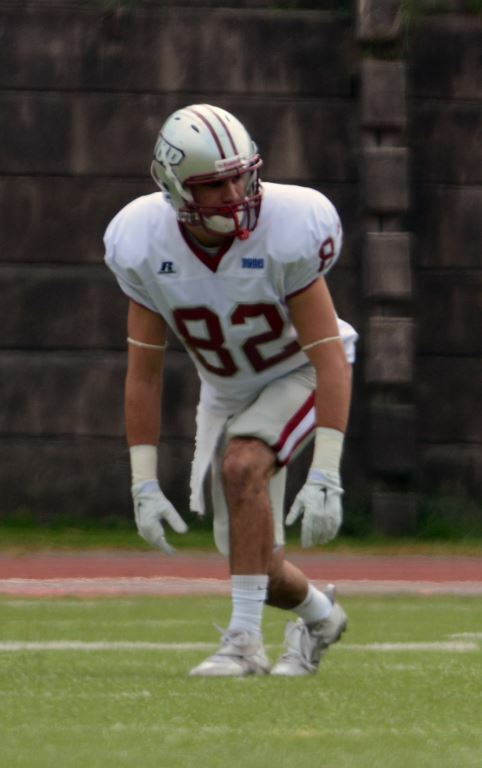 Ryan Lezzer now has 9 catches for 236 yards and 3 TDs through the first two games of 2014. Over the course of 14 games played as a freshman last year, he had 10 catches for 237 yards and 3 TDs. Seth Caldwell now sits at 897 career rushing yards, putting him just 103 yards away from being the 30th player in school history to total 1,000 career rushing yards. Jake Wingate’s interception against Keyser put him in a three-way tie for 6th on the school’s career list. His 9 career interceptions tie him with Todd Shaw (1999-2002) and Dennis Yohe (1995-1997). Erik Sellers had 15 tackles in the loss to the Golden Tornado, a total that ties him for 8th on the school’s single-game list. 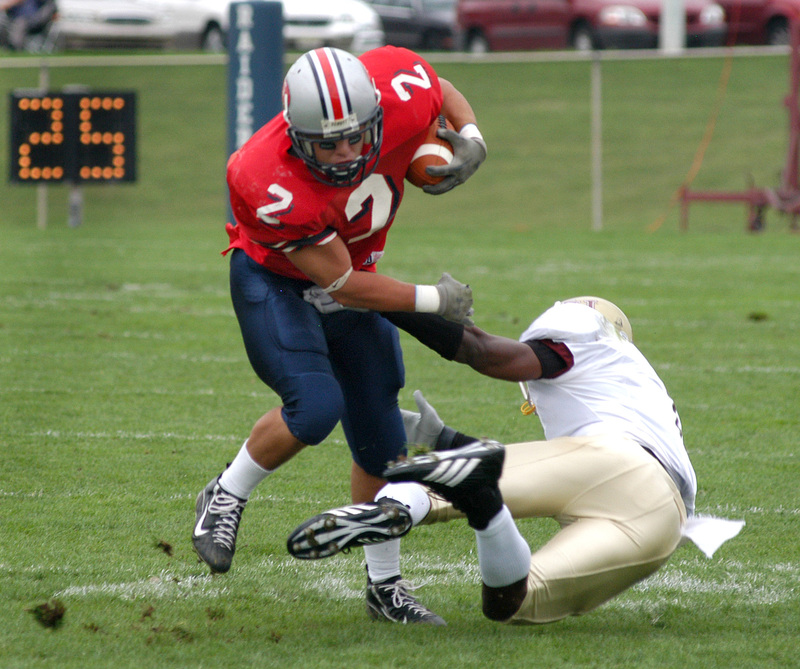 Dennis Yohe (1997), Jeremy Irwin (1999), Adam Jury (2006), and Jack Mellgard (2009) each also had 15 tackles in one game.